A small footprint allows the ZXP Series 1 to ﬁ t in the tightest workspaces, making it the right choice when space is limited. Its compact and durable design, and advanced network printer management software tools, make the ZXP Series 1 a perfect for multiple small ofﬁce installations, or large deployments of distributed card printers. You can count on the ZXP Series 1 to print clear, sharp and colour rich images when you need them, and where you need them. Its optional magnetic stripe encoding, Ethernet connectivity, and support for multiple card thicknesses permit the ZXP Series 1 to meet a variety of business and ID card needs. 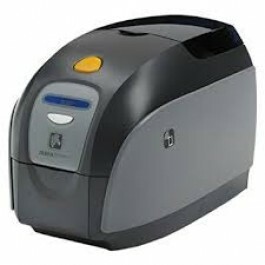 Affordable, Entry-Level Printer The ZXP Series 1 card printer has been designed speciﬁcally for customers who need a quality printer at a competitive price. Ideal for low-volume, single-sided printing applications in colour or monochrome, the ZXP Series 1offers a complete card printing solution with a minimal upfront investment. Its ENERGY STAR certiﬁcation and Eco-friendly print cartridges make it the best entry level printer on the market. • Windows XP, Vista, Server 2003, Server 2008, Windows 7 (32-bit and 64-bit compatible, Windows 8 (32-bit and 64-bit compatible). Please see zebra.com for up to-date listing of supported systems. NOTE: The ZXP Series 1 printer is designed to work only with Zebra ZXP Series 1 Eco-Friendly Load-NGo™ drop-in ribbon cartridges.